After watching that boring fest between Everton and Stoke that ended with penalties (there were some good penalties though), I braced myself to see the lads donning the new away kit and boy, I’m in love with that kit. Per Mertesacker led the team out and it was interesting to see the likes of Chuba Akpom and Alex Iwobi. Iwobi’s performance was of particular interest to his uncle, Nigerian football legend, Jay Jay Okocha, that took to Twitter to express his delight in watching his nephew play. Feeling head over hills watching my nephew Alex Iwobi live with Arsenal against Singapore eleven in preseason..great stuff son..
Arsenal almost drew first blood when Nacho Monreal drifted forward and it was intercepted by some Singaporean bloke. With speculation linking Monreal out of the club, one must wonder if the club would fold its arms and watch such a prized asset leave. When he arrived at the club, it took him a while to settle but Monreal is miles ahead of Kieran Gibbs at the moment. Alex Oxlade-Chamberlain was another player that was keen to impress and he wasted no time in blasting an effort that went wide. Akpom connected well with Iwobi on the left hand side with the young Nigerian firing a shot that was saved by the goalie. The onslaught on Singapore’s goal continued as Ox blasted a shot that was parried straight to Jack Wilshere’s path. The Englishman fired the rebound but a last-ditch block spared the goalie’s blushes. It was only a matter of time before Arsenal opened their goalscoring account for the season and it came from a very swift counter attack. 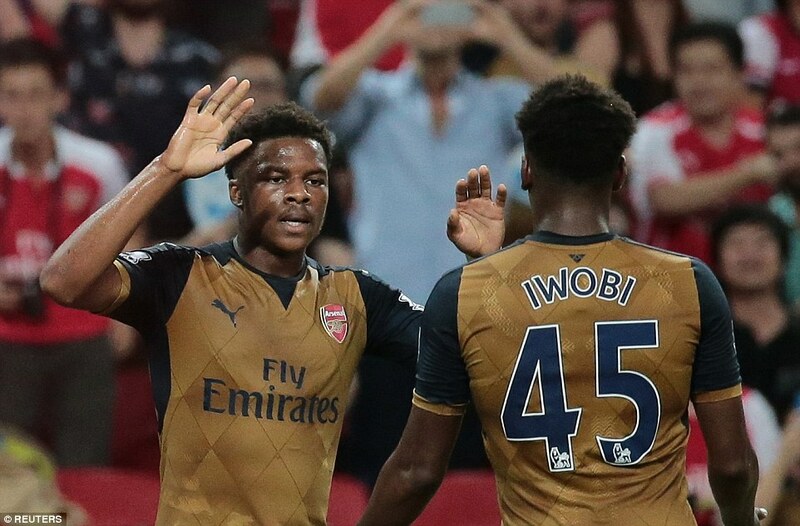 Iwobi drilled a ball to Akpom’s path but the forward was aware of Wilshere’s presence and he executed a dummy. When Wilshere tried to bring the ball under control, it fell to the path of Akpom that blasted the ball in to make it 1-0. Singapore managed to make a rear foray forward and Bai was the first to react to a corner but he headed his attempt wide. Gabriel Paulista blocked a shot to the mid-rift and hit the deck like a sack of potatoes. Emiliano Martinez took the job of a physio to stretch the Brazilian defender till he got back on his feet. That sent the stadium into raptures as the fans lauded the physiotherapy provided by Colin Lewin Martinez. That turned out to be Martinez last act because he was replaced at halftime by Wojciech Szczesny. Iwobi received an inch-perfect pass from the Ox but his first-timed volley was wide off the mark. Wilshere and Ox combined to provide a sumptuous ball for Iwobi on the edge of the area but he skied his effort much to his disappointment. Ox was next to get an attempt on goal as his effort slowly crept beyond the goalie and towards the goal line but a defender blasted the ball away to safety. Arsenal doubled their money when Matt Debuchy tripped himself and some how won a penalty from Jon Moss. Even if the Singaporeans would have felt hard done by, Wilshere didn’t care as he sent the keeper the wrong way from 12-yards out. Faris did well to fashion a chance for himself but his shot couldn’t beat Szczesny at his near post. Shortly afterwards, there was a flurry of substitutions for Arsenal as Willock, Gedion Zelalem, Dan Crowley, Jon Toral and Hector Bellerin (unveiling his new number 24) joined the fold. Toral played a role in the third goal of the night as he was upended by the goalie leaving Moss no choice but to point to the spot again. Watching the replays showed that Toral actually dived but Akpom repeated Wilshere’s feat by sending the keeper the wrong way yet again to make it 3 – 0. 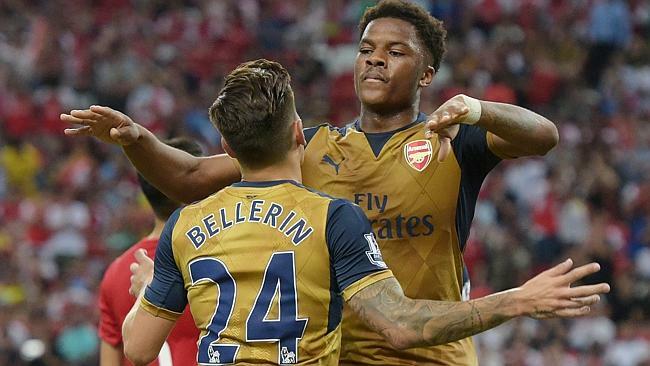 Akpom ensured that he walked away with the match ball when he latched unto Bellerin’s cross to make it 4 – 0. The buildup to the goal was excellent with the fullback showing some fancy footwork before having the composure to pick his spot and execute a deft cross that guided its way straight to Akpom’s head. Wenger ran out of superlatives for Akpom in his post-match conference and he stated that the forward has that killer instinct in front of goal. Akpom is one striker I have very high hopes for and my expectations for the young lad is to secure a loan spell to a team, preferably in the Championship, where he can excel like his former colleague, Benik Afobe. It was a great run-out for the lads and I’d be looking forward to the final against Everton. 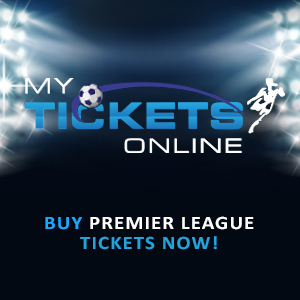 Posted on July 16, 2015, in Arsenal, Football, Match Report and tagged Arsenal, Chuba Akpom, Football. Bookmark the permalink. Leave a comment.